After several hours of soaking up history in St. Joseph, Missouri and Atchison, Kansas (Pony Express Museum, Patee House, the house where Jesse James was killed, and Amelia Earhart’s birthplace), we were heading south along the Missouri River toward Kansas City and Independence when we stumbled upon the W. D. Pickers Antique Mall at Exit 20 of Interstate 29. A giant, new, 10,000 square foot building with no personality whatsoever, it didn’t look like the kind of place where any antique bargain could be found. However, as we know from experience, an antique hunter can never tell where a great find will surface, so in we went. Many of the 120 dealers inside dealt with the kind of antiques and collectibles we like – toys, advertising, political items, paper things, holiday decorations, etc. For the most part, they knew their prices, too. However, every dealer offered a minimum of a ten percent discount, and many were offering twenty percent off, so that made the prices much more appealing. 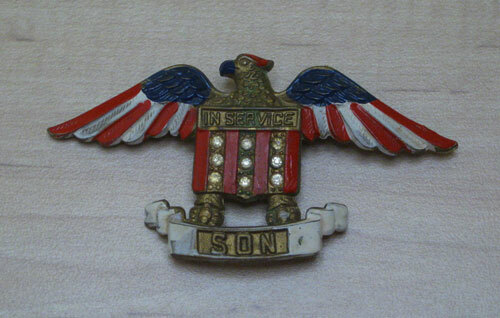 We walked out with three items that we were quite happy about: a Roosevelt-Truman bumper sticker from 1944, a plastic patriotic WWII pin with an eagle, a shield, and the word “Son” on it, and a large, approximately five-inch tall bisque long-billed Donald Duck figurine. Jim learned early on in his political items collecting that Truman pieces are relatively rare, especially among 20th century candidates. He had joked before the trip that he hoped to find a Truman piece in Missouri. Lo and behold, there was the Roosevelt-Truman bumper sticker. The price of $30 may seem steep, but it’s the first one Jim has ever seen. After all, bumper stickers aren’t the type of thing usually saved for posterity. A nice, large Truman button for $30 would have been better, but collectors know to take what they can get. For the past several years, both Jim and I have been looking for affordable WWII home front collectibles. As the “Greatest Generation” passes on, the younger generations are becoming more fascinated by this dramatic period in history and more appreciative of what their parents and grandparents went through and accomplished. I don’t know how many women actually wore the patriotic jewelry from the 1940’s that I see at flea markets and in antique shops, but it’s very interesting and colorful. I thought that this pin made of early plastic and accented with sparkling jewels was a good buy at $12. Obviously, it was intended to be worn by a mother whose son was in the service. The most expensive item we bought was the bisque long-billed Donald Duck. This jaunty guy stands relatively tall at about five inches. His paint is excellent (Many of these bisque figurines have severely faded paint.) 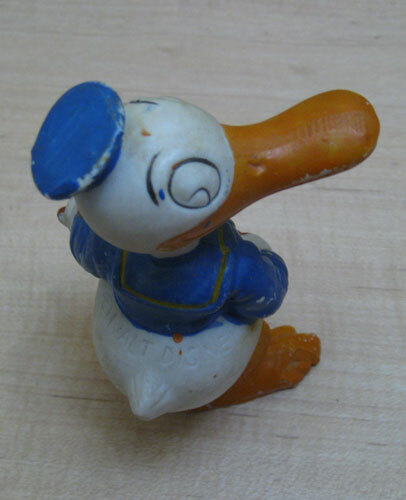 and he’s marked “Walt Disney” and “Made in Japan.” Donald Duck had a long bill for only a few years. He started out that way in 1934, but it was already shrinking by 1937, so it’s pretty easy to date these figurines. 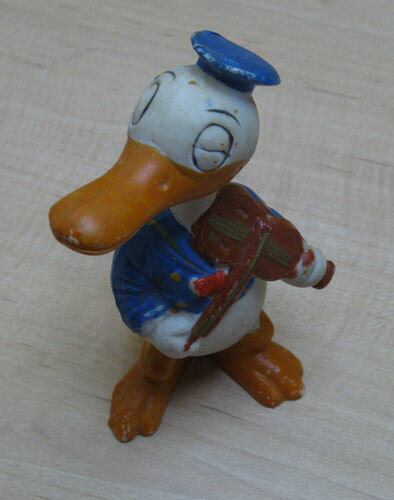 We especially liked this Donald because we don’t ever remember seeing one this size playing a violin. He cost $58. That may seem expensive, but we’ve seen comparable pieces for more than $100 on numerous occasions. 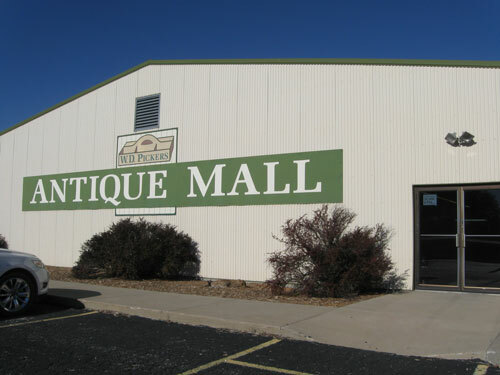 Lesson to be learned from our experience at W. D. Pickers: Don’t overlook large, interstate antique malls. There may not be as many bargains as can be found at a flea market, but good quality items at affordable prices are not that unusual. This entry was posted in 1930's, 1940's, Americana, Carol, Disney, Ephemera, Historical, Jim, Political, Road Trip, Toys, WWII. Bookmark the permalink.